On Monday of last week I made the decision to close out my position in Kinder Morgan (KMI). I was very late to the party on this one and the returns definitely show it. I have plans to repurchase shares of KMI after the wash sale period ends in late January. I don't take selling shares lightly. 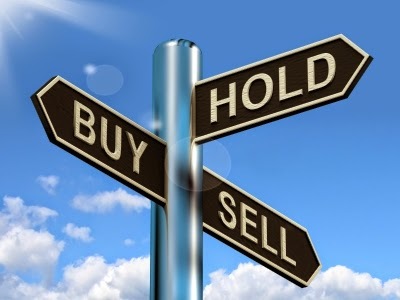 In fact I have over 130 recent buy articles and this is just my 7th recent sell post. So selling is something that I don't normally do. However, there was big news from KMI earlier this month with a 75% dividend cut and that made me rethink my position. I mention in my introduction that one of the reasons I like to write about my purchases is because I have a record of my investment thesis and can look back to see what I missed to hopefully learn from it and avoid the same mistake in the future. I find the sale posts are often more enlightening for my own purposes. Kinder Morgan was one of the earlier purchases for my FI Portfolio. I initiated a position in October 2012 with a purchase of 55 shares. I then added 36 more shares later that month, 34 more shares in November 2012, 40 shares in December 2012, and 45 shares in March 2014. 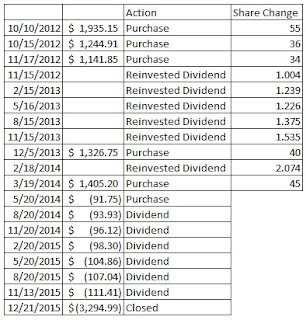 There were also 6 dividends reinvested along the way that added another 8.453 shares. The rest of the dividends were received in cash. In total I owned 218.453 shares of Kinder Morgan. I sold all of my shares at $15.12 on December 21. After commission and fees I received $3,294.99 in proceeds from the sale. That doesn't exactly compare favorably to the $7,053.86 in cost basis before reinvested dividends or the $7,356.50 cost basis including the reinvested dividends. The following table highlights the cash flows for my investment in Kinder Morgan. I obviously had a horrible return with this investment turning $7,053.86 into just $3,294.99. That's a -53.29% return from price appreciation. Dividends did provide a bit of a reprieve with $703.41 received in cash that represented a 9.97% return. Total return then works out to -43.32%. Ouch! On an annualized basis it's even worse with a -20.30% return. Double ouch! Returns are net of fees but before taxes. Kinder Morgan was one of my oldest holdings so it hurts a bit to get rid of them from my portfolio. However, the situation has completely changed with Kinder Morgan after the 75% dividend cut. Originally my plan was to just hold the shares that I owned because the damage had already been done via share price depreciation but that has since changed. The combination of end of year tax planning, a huge loss from KMI, the dividend cut, and uncertain future led me to move ahead and cut my losses. I stopped adding to my Kinder Morgan position back in early 2014. At the time it was my largest dividend payer and still was up until the dividend cut announcement. In term of portfolio security it didn't make sense to add anymore to KMI even though there were ample opportunities to add at what appeared to be good valuations. About a year ago, I had begun getting concerned about KMI and whether the dividend truly was safe. However, with everything else going on in my life losing $400 in dividends just wasn't a high priority. I failed to do research and truly dig into the numbers and just took managements' word as gospel. So there's no one to blame but myself. Kinder Morgan had much more exposure to commodity prices than I expected and that was something that I missed in my original research on the company. What really bothers me though is that Richard Kinder continued to reiterate the plan to grow dividends by 6-10%. So one month earlier we get news that KMI should continue to increase dividends 6-10%, sure that's lower than the 10%+ forecast but it's okay because the yield is solid and everything oil is crazy right now, so it was acceptable. Then we get news of a 75% dividend cut. For the health of the company the cut was the right move. KMI has stretched it's balance sheet and was working it's way through yet another acquisition. The acquisition announcement should have been the writing on the wall for the priority of cash. While the acquisition model isn't necessarily bad, a big problem comes when you have to access the capital markets. Kinder Morgan routinely raises capital through selling shares or taking on more debt. That's fine when the stock market is pricing your shares reasonably but after the sharp decline throughout the last couple months it made no sense to sell additional shares. Credit markets were also just about frozen out. For companies that rely on the capital markets the credit rating should be the number one priority and it clearly won out here. Going from investment grade to a non-investment grade credit rating would have severely increased the cost of capital. I would consider adding KMI back into my portfolio in the future; however, I need to see how things play out for the company in the meantime. Management said part of the reason for the dividend cut was to self-fund it's capital expenditures. I want to see what that looks like in practice as opposed to theory because the dividend was supposed to continue growing 6-10% and that's no longer the case. I believe the assets that KMI has are vital and top notch and will still have a large demand over the next 10-20 years. However, after the dividend cut I'm not taking management's word for anything and am firmly in show me mode. The dividend cut alone reduced my dividends by $336.42. Closing my position reduced them by another $109.22. The forward 12-month dividends for my FI Portfolio are down to $5,528.60. Including the $61.08 from my Loyal3 portfolio brings my total taxable accounts forward dividends to $5,589.68. If you owned Kinder Morgan did you sell or are you holding on? Have you made any sales to clean up your portfolio or for tax loss harvesting? 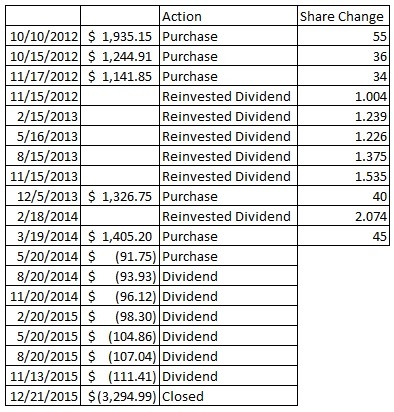 Kinder Morgan whacked a lot of dividend investors. You nailed one of my biggest concerns.....management said the dividend raises were going to continue......and instead they cut the dividend by 75%. The only clue we had that something had changed, was that the CEO quit buying gobs of stock on the open market. I still haven't figured out why the company issued so much debt and bloated the balance sheet, but I'm sure we'll hear the real story at some point. If I don't talk to you first, Happy New Years buddy! I failed myself and didn't take the time to dig into the numbers to check the viability of what management was saying so I can only really blame myself for taking their word for it. However, it's very odd to me that 1 month before the cut they were still expecting raises of 6-10%. I know the share price declined a lot over the 2 weeks or so right before the cut but management had to have known this was a realistic possibility. So there's 2 issues that I have with KMI management either they can't really foresee their future capital needs as clear we thought or they purposely deceived shareholders. I don't think anyone would have been upset with KMI if the dividend increases slowed down and they stopped raising it every quarter if it means that it's secure. Sorry about that divvy cut, that hurt a lot of investors. I had my eye on KMI since before they gave up their MLP status. Never pulled the trigger though. Going forward, my strategy has changed. I believe what's more important than a dollar now is a dollar 10 to 20 years later. Therefore if a company doesn't have at least $1 billion in FCF, including divy's paid, I stay away. Some of my current holdings don't fit that criteria, as I just started that strategy, but that also eliminates several very popular stocks, like SO. Good luck in your future, I know you'll do just fine! The cut from KMI definitely hurt since they were my largest dividend payer and it moved them from $400+ annual dividends to just over $100. Interesting strategy regarding cash flow. I prefer cash flow to check the security of the dividend although I've never set a hard requirement on FCF. For me it's more important for the cash flow to be good relatively. The $1 FCF requirement could potentially eliminate some of the smaller companies that still have excellent prospects. To me it also depends on the stability of their cash flows. SO might run a bit tighter but I'm guessing their cash flows are much more stable that other companies as well. I don't understand the buy high, sell low position everyone is taking on this stock. A cyclical downturn in a market sector (energy), isn't a reason to close out a position in a company that made the right long-term (albeit tough) financial decision for itself. I guess we all have our tailored investing principles though. Happy Holidays! 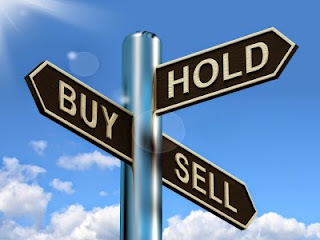 Yes everyone selling now is following the buy high sell low approach which is killer for the portfolio. However, if the primary investing methodology for your portfolio is safe and growing dividends KMI no longer fits. Plus my faith/trust in management took a big hit which is another reason that many people sell. If management was open and upfront about the issues and also if they had slowed down the dividend growth I'd have been okay with it. To me it seems like management is either not looking at everything as a whole, has trouble forecasting their own operations 3 months out, or purposely deceived investors. You can't go from saying 6-10% growth of the dividend over the next year to a 75% cut in just one month without one of those 3 being true. With that being said I don't see oil making any significant move to the upside so I took the opportunity to do some tax loss harvesting and do plan on adding KMI back into my portfolio. The assets are still solid and will be necessary over the long term. I think the company is much better positioned now after the cut but why not lock in the tax loss and get a benefit from it? I guess that is one way to view it, management said in their conference call earlier in the year they were not going to project 2016 dividends anymore, they were only set on the fact the 2015 dividend was going to be $2. for me everything is just a paper loss until I sell, if I plan on staying in a company, I guess I just stay. Tax loss harvesting is negligible, to most portfolios. I haven't seen anything less than transparent from the company or management. I expected this cut, quick look at the cash flow made it very clear the current one was not sustainable. As recent as a month prior to the cut management was forecasting 6-10% dividend growth. Then a few weeks later there's a 75% dividend cut. December 4 damage control press release management brought up the 3Q earnings call and the 6-10% dividend growth. Now the dividend is cut by 75% which is a far cry from the 6-10% growth. Tax loss harvesting might not provide much help but I don't see how I can really hurt in this scenario. As long as I gain more than a $25 benefit, the approximate dividend payment from my position, I would come out ahead by taking the tax loss. Understand that its a hard decision to make to sell KMI, understand you when one of your strategies is just passive income. Although it surprises me that youre selling KMI, they did this to keep their credit rating and I do think this is the best for KMI in the long term. Man, I totally agree with you and this is a reason for me to hold KMI and even adding more shares (playing the recovery card). I hold 54 shares of KMI as well and currently sitting at a bit over 60% loss in capital. I still haven't decided on what to do with it. I am holding it in my IRA account and so tax purpose isn't a reason to sell. But I need to decide if I need to reinvest the capital in some other stock. Over the long term I expect KMI to do well and deliver solid results. Since you hold the shares in an IRA that muddies the waters a bit since you can't really take advantage of the tax losses. I do plan to reenter a position in the company in the future though for what it's worth. I do not think KMI is done and disagree that it's future is uncertain. Are you investing for the next 2 to 3 years or for the next 20 years? Do you really believe that KMI with its energy (mainly natural gas) transportation infrastructure would end? I do not think so. I think this is a lesson even for the management to be careful next time and not overdo it, maybe they learned it or not. I believe that 5 years from now this will not be remembered at all. And if not 5 years from now, then 10 years from now for sure. I have time on my side to wait this out. Yes it would be a different story if the company was going to go belly up, but I do not think this is the case (I may be wrong). So to me this is now more of a capital appreciation and growth stock than a dividend growth stock as I continue reinvesting dividends to lower my cost basis (I even may be adding more cash but not now - I want to see a sign of recovery first to commit more money and ride the wave up). So I am sitting tight, holding, reinvesting dividends and playing this out. I don't think KMI is done either which is why I mentioned that I would likely reenter a position. I actually agree with the dividend cut and think it was the best thing for the company over the long term. It shores up their cash flow which was necessary. My big issue with KMI is the way management handled everything. They kept raising the dividend over this past year, kept reassuring investors that the dividend was safe and would continue to grow. Either management purposely deceived investors or they have a very hard time forecasting their company's operations just 1 month out. Since I don't expect oil to be making any big moves higher which means KMI is likely to go nowhere as well, I figured I might as well take advantage of the large decline and harvest the tax losses. Like I mentioned earlier I still think the assets are solid and necessary so I do plan to reenter a position in the company. One more thing. While I don't think the company's future is uncertain, what the dividend does and how quickly it grows is definitely on uncertain ground now. I've thought about selling our KMI shares after the recent dividend cut but so far have decided to hang on. Hopefully, I don't regret my decision to hang on. I do believe the dividend cut may help to save KMI long enough for the next turn-around. Meanwhile, just praying that the current dividends continue to roll in. I think that KMI is fine moving forward and will likely open another position in over the next month or so. I'm curious to see how dividends grow in the future though. While I liked the increases each quarter, given the issues and dividend cut I think slower and either semi-annual/annual raises are likely in the future. I don't blame you at all for selling. Management misled shareholders. However, they were in a bind and about to lose their credit rating. Their backs were against the wall but that's still no excuse for poor money management. I thought about selling all myself for tax loss harvesting. I'm still holding a fairly large position in KMI currently but it's down so much at this point I'm just going to hold on. If the stock doesn't start recovering then I may take the tax write off for next year. They own some major assets that still generate a lot of cash but it's the huge debt load that's so scary. I guess we'll see what happens. I completely agree with the move for the health of the company; however, I also feel misled. I was thinking of waiting until early 2016 to sell but decided it's better to get it over with. Like you I think the assets are still solid but the debt load really is frightening. I plan to start a smaller position in KMI sometime in early 2016 once the wash sale date has passed. Totally understand your reasoning behind this sale. Yes, it's true that 'sale' posts are very rare among all the DGI bloggers so when they do occur it's usually for good reason. KMI is just another reminder that no dividend is ever guaranteed no matter who is paying it. I have commented elsewhere how I too went through dividend cuts with GE, WFC and IR back in 2009 but held on to all those shares. I know many are waiting for oil to make its rebound. In the meantime it is quite ugly in the patch. Thanks for sharing. The sale posts are quite rare but they are a necessary evil sometimes. I do plan on adding KMI back into my portfolio so this is more of a "pause" post rather than a true sale post. Trust me it's very ugly in the patch both on the investment side and the drilling side. Happy New Year! Great article...you are definitely not alone as I am sure they are tons of other investors re-evaluating their energy and energy-related holdings in what is starting to look like a 'lower for longer' situation when it comes to oil prices. Hopefully a lower cost basis in the new year will pay off in spades for you in the long term.